and the work of her American students presented in a variety of formats. including the leaders of the major French archives of her material. For information on conference proceedings publication, please contact info@nadiaboulanger.org. 1:00 "Before Nadia: The French Training of American Composers"
1:30 "A Complex Heritage: Nadia Boulanger's Collections"
2:15 "The Franco-American Committee and the Beginnings of the American Conservatory at Fontainebleau"
8:30 "Useful for Education and Pleasure: Nadia Boulanger as a Performer of Music History"
9:30 "Nadia Boulanger and Marie-Blanche de Polignac"
10:00 LECTURE/RECITAL "Nadia Boulanger's First American Student, Marion Bauer"
10:30 "Fauré, Nadia Boulanger, and Copland: The Nature of Influence"
11:00 "Fauré chez Piston: Nadia Boulanger and the Bequest of a Style"
1:00 "Nadia Boulanger's Three Lectures in Houston"
1:30 "Nadia Boulanger and Helen Hosmer at the Crane School of Music"
"The Music of Copland, Allen Shawn, Virgil Thomson and Ingolf Dahl"
3:00 "Nadia Boulanger's Impact on American Music Education: American Summer Courses During WWII"
3:30 "Nadia Boulanger and the Women of Wisconsin"
4:00 "Nadia Boulanger's Influence on Peggy Glanville-Hicks"
including David Conte's Prelude and Fugue (In Memoriam Nadia Boulanger), Ken Cowan, organ. 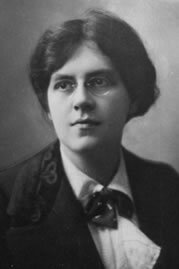 8:15 "Nadia Boulanger and the Passacaglia"
8:45 "Nadia Boulanger's Approach to Style Analysis and Harmony"
All students of Nadia Boulanger are invited to share observations and favorite stories in this session. 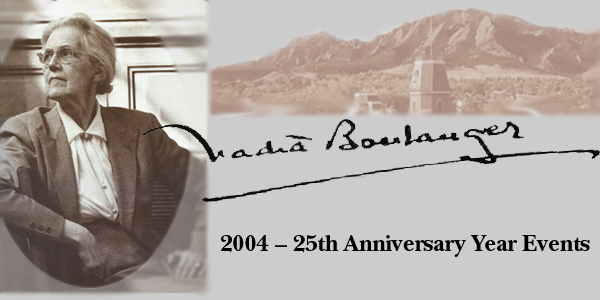 1:30 "Nadia Boulanger's Lasting Imprint on Canadian Post-War Music"
2:00 "Nadia Boulanger and Louise Talma"
2:45 "Aaron Copland's Paris of the 1920s and Its Effect on Grohg"
3:15 "John Vincent and Nadia Boulanger"
"The Music of Daniel Pinkham"
REGISTRATION FEE FOR ALL SESSIONS, except the separate ticket events, is $125 US. Discount for students. Payment can be made by cash, check or credit card beforehand or at the time of the symposium. For further information, contact amrc@colorado.edu or (303) 735-3645. The American Music Research Center is a rare music resource dedicated to exploring and preserving the rich traditions of American music. The Center shares its activities with faculty, scholars and the public through concerts, publications and sponsorship of scholarly activities, such as symposia and lectures. It serves as a research archive for performers as well as community members who wish to preserve American music and enhance its cultural and transformational potential for future generations. This symposium will mark the beginning of a process, the culmination of which will be a permanent location in Colorado devoted to the study and preservation of materials that document Boulanger's extraordinary contribution to American music. Contributions, letters and manuscripts that preserve the legacy of Nadia Boulanger can be sent to the American Music Research Center. Registration fee for the symposium will be $125 plus approximately $100 for the banquet and three evening concerts. Special fees for students will be available. Full details about the symposium, concerts, banquets, transportation and hotels will be sent upon request. For full information on transportation, activities and a registration packet, email the American Music Research Center at amrc@colorado.edu. Subscribe to our email updates mailing list. 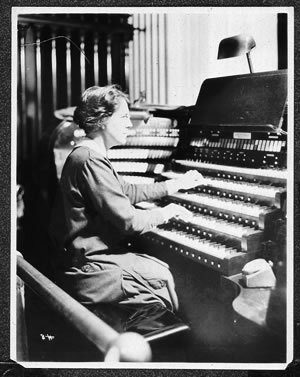 Nadia Boulanger and American Music. Presentations in a variety of formats are sought in order to speak to and engage the general public as well as a scholarly audience on the subject of Nadia Boulanger, her life and influence, her contribution to musical pedagogy, and the work of her American students. International participation in this conference is anticipated, including the leaders of the major French archives of her material. 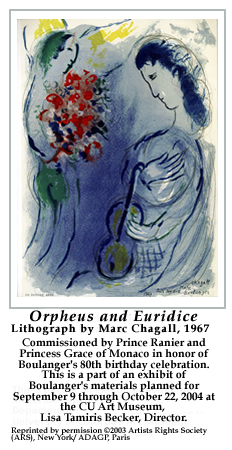 An exhibition of Boulanger manuscripts, letters, and memorabilia is also being planned in conjunction with this meeting, the 25th anniversary year of her death. 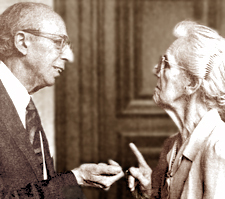 Aaron Copland and Nadia Boulanger, 1972. Photo © Douglas Lyttle. "Nothing is boring in our life except ourselves." ©2002, 2003, 2004 Boulanger America.